Simon Allen discovers why the manufacturer is so confident about the quality of its new flagship Thunderbolt, Pro Tools HD and Dante-compatible interface. There is no hiding from the fact that this interface is probably the best interface Focusrite has ever made. There’s only one question that we need to answer here: is this the ultimate audio interface to date? Admittedly, there are features about this product that won’t suit everyone. However, if money were no object and sound quality was the biggest consideration, has the Red 8Pre really set a new standard? Due to the natural progression of audio interface development, manufacturers have been focused on designing the “cleanest” and the “flattest” sounding pre-amps and converters they possibly can. There is of course still merit for these achievements, particularly for those that are using additional hardware to ‘colour’ their sound to taste. The original job role of an audio interface was simply that – to interface your front end with your Digital Audio Workstation. However – and this is a big however for me – for some reason this concept has hung around like a bad smell. This apparent ‘correct’ method of working should perhaps now be challenged. Thanks to the advancements in technology and the dramatic price drops of pro-audio equipment, anyone can set up a recording studio of sorts at home. While this has given way to creativity in new ways, it has in fact limited some elements of creativity upon capture. We all seem to focus on keeping the signal on ‘tape’ as clean as possible, then expecting our plug-ins to add all the magic. What happened to tracking a great mic, through a 1073 with a TLA-100A inserted, which then hardly requires any further processing in the mix? I’m not suggesting we need valve-driven interfaces, but I do wonder if the chase for purity has gone too far. The trouble is, those that are using an interface, often as their only hardware, are missing out on the exciting experience a large-format studio offers. For me, this is why the Red interface range by Focusrite is such a key product line in today’s market. These interfaces, within this new era of preamp and converter technology, began with the now well respected RedNet series, followed by the Clarett interfaces and of course the Red 4Pre. The Red 8Pre follows in the footsteps of the Red 4Pre, which presented even more impressive EIN and total gain values. What I admire so much about the approach Focusrite has taken with these latest Red products is the combination of crystal clear and flat converters with low-noise preamps, while keeping some colouration in the pres. They aren’t hugely coloured in their standard mode, making them suitable for those sensitive scenarios, such as classical music recordings, but they are still pleasing to listen to somehow. Then in their ‘AIR’ mode, which adds exactly what the term suggests via some additional circuitry (not DSP trickery), they become really exciting to work with. I really enjoy using this latest generation of Focusrite preamp, of which the Red 8Pre is currently the pinnacle. The Red 8Pre’s party piece is of course it’s audio I/O capabilities. Not only does this single-rack-mount unit offer an impressive 64 channels of inputs and outputs, but this total comprises a very flexible array of connections. Digitally there are dual ADAT connections for a total of 16 channels over light pipe (@ 48kHz), as well as SPDIF and Dante. Note, there aren’t any AES inputs or outputs, which might be a consideration for some applications. Focusrite presumably perceive the Dante connections trump any need for AES. On the analogue side, there are monitor outputs, two independent stereo headphone outputs, 16 line inputs, 16 line outputs and of course the eight Red preamps. The first two channels also offer direct instrument inputs, making this unit suitable for both working from a studio rack and mobile recording use. However much I enjoy the sound this unit delivers and respect the design approach, there are a couple of issues I have with the Red 8Pre. The first is with the connectivity for the eight preamps, which is achieved via a D-Sub. This means you need a break-out cable to XLR, even if you’re on location recording a single microphone. 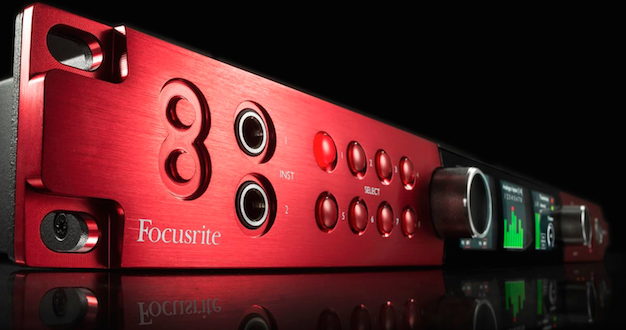 With their Clarett range, Focusrite offer an 8Pre and an 8PreX, with the latter being a 2U unit. Why they didn’t apply the same principle to the Red 4Pre and Red 8Pre respectably, I think is a shame. If you seriously need the channel count this thing offers, then I doubt you’d be too bothered by the increase in size if it were easier to use. The last major talking point for the Red 8Pre is its variety of interfacing options. There are dual Thunderbolt ports, which will work with any Mac that has a Thunderbolt or Thunderbolt 2 port. While this restricts the interface to Macs only, the benefits of round trip latency as low as 1.67ms speaks for itself. I’m really pleased to see dual Thunderbolt ports to allow daisy chaining and that they actually include a 2m Thunderbolt cable with the unit. A rarity for Thunderbolt devices in general. Alternatively you can connect the Red 8Pre to a Pro Tools HD system via two mini-DigiLink cables. This provides Pro Tools HD users with an exciting alternative to Avid’s own hardware, particularly now Avid has separated the software from the hardware with a separate DigiLink I/O License. The only consideration is that the Focusrite Control app for changing settings on the unit only works over Thunderbolt. If you don’t have a Thunderbolt port on your Pro Tools HD system, all settings would need to be made via a different machine or from the front panel of the device. Finally, as presented for the first time with the Red 4Pre, The Red 8Pre offers dual Dante connections. This is a really exciting move for an interface to offer, adding more possibilities even for PC users. However, there is another issue here. Just as with the Pro Tools HD connectivity, you can’t control the unit over Dante. I’m hoping Focusrite will add the Red 4Pre and Red 8Pre to their RedNet control app. [Ed: Focusrite says that this is indeed part of their plans]. This will be really exciting, even enabling these amazing quality preamps to be used in the live sound world as you would with a RedNet unit. There are several reasons why this unit is so strong on paper and why it carries the price tag it does. However, the sound you can achieve with the pre-amps is so wonderful, this should be as significant as the Red 8Pre’s chart-topping connectivity and feature set. There will be a few inconveniences for some users thanks to the control only over Thunderbolt, but there are a number of hurdles the Red 8Pre has already overcome. 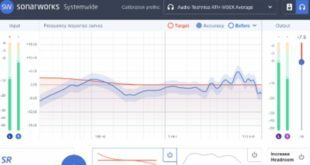 I like that Focusrite has stayed firm on delivering Thunderbolt connectivity, due to the proven latency benefits. The on-board screens and user interface is very good, hopefully with future control solutions to be announced. This is an all singing and all dancing interface at the very top of the market. The only aspect that Focusrite don’t cover is any built-in DSP processing which is a shame, but the flexibility and sonics on offer here are easily worth the sizeable investment. Simon Allen is a freelance internationally recognised engineer/producer and pro audio professional with nearly two decades of experience. Working mostly in music, his reputation as a mix engineer continues to reach new heights.